Beautiful You: Nails #5 | Glitter! 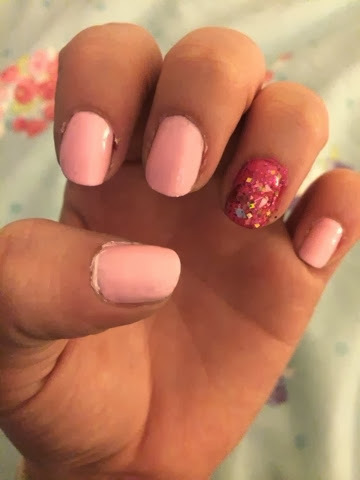 I didn't know what to post today as I have been really busy sorting out next week, so I just though that I would share a simple nail post with you guys! I have recently bought some of the Models Own Hyper Gel nails and I cannot rave about them enough. Firstly they have an amazing colour range and the shiny finish they leave is amazing, if you didn't have time you really wouldn't even need to use a top coat! For these nails I used two hyper gel polishes, Cerise Shine (the darker pink) and Pink Veneer (the lighter one). I then added the glitter top coat using Hot Stuff also from Models Own! Please excuse the lighting, as I said this was a very last minute post as I had no inspiration! I hope you enjoyed it none the less and I hope you are all looking forward to next week as much as I am, it should be a really exciting week on here!! Hi Megan! I just thought that I'd let you know that I am a huge fan of your blog and because of that I have nominated you for the Liebster Award! You can find detail on this in my blog post and find the questions that I ask you underneath who I tagged, by clicking here.